Ken Tucker was born on November 10, 1912 and died March 20, 2012. He was 99 years old. Ken turned pro in 1933 at the old Mountain View course in Lacey, WA. In January 1936, he began a 42-year tenure as Head Professional at the Everett Country Club – his starting salary was $50 a month. Ken served the U.S. Navy from 1941-1945, the only interruption in his career as a PGA Professional. Ken was named the 1956 Everett Herald Man of the Year in Sports and was well-respected in the community. He was made an honorary member of EG&CC in 1976. He served the Pacific Northwest Section as first Secretary, then Treasurer and finally President from 1952-1953. Ken played an incredible game. He had scored as low as 60 (at Hillcrest, the predecessor to Cedarcrest) and 63 (at EG&CC). He won the 1939 Pacific Northwest PGA Championship and the 1947 Pendleton Open, and in 1952 tied first in the Tacoma Open. He played in the first Bing Crosby National Pro-Am tournament (the “Crosby Clambake”) in 1937 and every year after through 1963, except for the years during WWII. He played on the Hudson Cup professional team in 1950 and served as captain in 1952 and 1953. 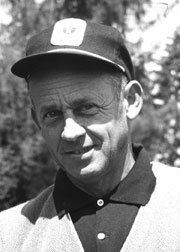 Ken Tucker was named the Pacific Northwest Golf Professional of the Year in 1960. In 1982 he was inducted into the PNW PGA Hall of Fame. In 1984 he received a special award honoring his 48 years of dedication to Junior Golf. He was truly the dean of club pros. Ken is survived by his wife Mary and two daughters. The family will be having a private funeral. A reception and celebration of life is Friday, March 30, at Everett Golf & Country Club at 1 p.m. Mary requests that in lieu of flowers, donations should be made to the Pacific Northwest PGA Junior Golf Fund.